Posted on Tue, Apr 10, 2012 : 1:30 p.m. If you've read the "Omnivore's Dilemma," or seen American Meat or Food Inc., you've already met Joel Salatin, the "Christian-libertarian-environmentalist-capitalist-lunatic-Farmer," on the page or on the screen. His piercing truths about the state of American agriculture are told with the outrageous humor, wit and vinegar of a modern day Mark Twain, and he travels the country as a sought after speaker as Twain did as well. Twain's observation that "There are lies, damned lies and statistics" sounds like something Joel Salatin would say. From Salatin's Polyface Farm in Swoope, Va., he's written nine books with titles like "Everything I Want To Do Is Illegal," "Holy Cows and Hog Heaven" and "The Sheer Ecstasy of Being a Lunatic Farmer." If you're intrigued by Joel Salatin's perspective on being an extremely successful and sustainable farmer, you have a chance to see him in person on April 24. The People's Food Co-op is bringing the renegade farmer to Ann Arbor as a speaker at the annual PFC meeting. 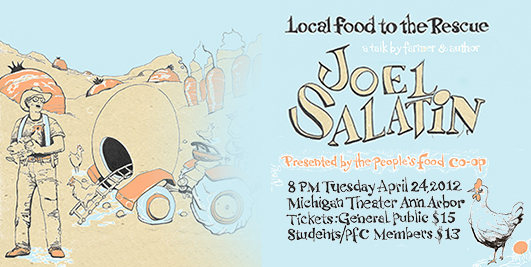 Before the talk, the PFC is hosting a fundraiser event featuring Salatin, and benefiting the new Washtenaw Food Hub. The talk for the annual meeting is entitled "Local Food to the Rescue," and will take place at the Michigan Theater on April 24 at 8 p.m. Tickets are available at the Co-op and through Ticketmaster. "A farm regulated to production of raw commodities is not a farm at all. It is a temporary blip until the land is used up, the water polluted, the neighbors nauseated, and the air unbreathable. The farmhouse, the concrete, the machinery, and outbuildings become relics of a bygone vibrancy when another family farm moves to the city financial centers for relief." “Read things you're sure will disagree with your current thinking. If you're a die-hard anti-animal person, read 'Meat.' If you're a die-hard global warming advocate, read Glenn Beck. If you're a Rush Limbaugh fan, read James W. Loewen's 'Lies My Teachers Told Me.' It'll do your mind good and get your heart rate up." It's sure to be an interesting evening. And as Twain said "Against the assault of laughter nothing can stand." Wed, Apr 11, 2012 : 2:25 a.m. So excited to see him speak at the Michigan Theater!